As with all my reviews, this is a totally subjective personal view and not an in-depth technical analysis. For more mainstream reviews, check out Engadet, Pocket Lint, Expert Reviews, and Casey Johnston’s Air vs Pro comparison on Arstechnica if you’re also considering an Air. My old faithful Dell E4300 has done its dash. Actually it still works; it runs Ubuntu well, it has an SSD and 4GB of ram which makes it pretty nippy for web browsing and lightweight tasks, but what sealed its fate was my work laptop – a 15″ Retina Macbook Pro. After getting used to that gorgeous 2880×1800 screen, I found I just couldn’t go back to the Dell any more with its 1280×800 TN LCD (ugh), horrible touchpad and 2009-era performance. This entry was posted in Articles, IT, Linux, Reviews and tagged apple, dell, e4300, laptop, latitude, macbook pro, notebook, retina, Review on January 20, 2014 by Alex Forbes. I think these specs make for the best price / performance balance on most of the laptops I’ve priced up. This entry was posted in General, IT and tagged dell, e4300, laptop, mac, macbook pro, notebook, retina, ubuntu, ultrabook, xps on December 28, 2013 by Alex Forbes. Linux support has turned out to be much, much better than I anticipated, in fact I’ve basically switched to Ubuntu. The battery life is probably the one that concerns me most, but I suspect the excessive hdd duty cycle and poor intel graphics performance (using too much cpu) are contributing factors. I’m sure the Intel issues will be fixed by 9.10… Hdd issue just needs some tweaking. My colleague also bought an E4300, and has installed SLED (Suse Linux Enterprise Desktop) on it. It worked well for him, although there were some issues with sound and he had to spend a bit of time getting it working. All in all I’m impressed, this is the best Linux experience I’ve had on a laptop, and it’s also the newest laptop (age-wise) I’ve ever owned. 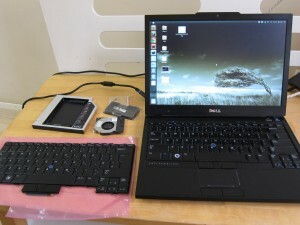 This entry was posted in IT, Linux and tagged dell, e4300, laptop on April 25, 2009 by Alex. Dell E4300 or HP 2710p? Recently I picked up a “resealed” (very close to new) Dell E4300 at what I think was a pretty good price, well below the $4000 RRP. The downside is that there’s no warranty on it unless I purchase one from Dell at about $460 for 1 year going up to over $900 for 3 years. Since even the 1 year warranty is over a third of the cost of the machine and I can fix/diagnose many problems myself I think I’ll pass. It’s a risk but a calculated one. Of course I didn’t really need an E4300, I already have a HP 2710p tablet PC which has been serving me very well. So now I have to decide which one to keep. To help me evaluate, I’ve rated them on the categories that are important to me, other people will have different priorities. The E4300 is configured with a Core 2 Duo SP9300 (2.26ghz, 6mb L2 cache), versus the U7600 (1.2ghz, 2mb L2 cache) in the 2710p. While the 2710p rarely frustrated me with slow performance, it is running Vista and I have disabled indexing and the Aero desktop effects. I probably won’t need to do this on the Dell. The 2.5” 5400rpm hdd in the Dell is also streets ahead of the 2710p’s 4200rpm 1.8” IDE hard drive – a major downside of many 12” ultraportables. 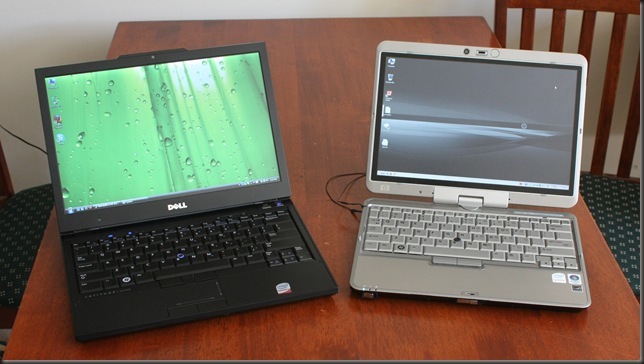 Both have 4gb of ram (DDR2 in the 2710p and DDR3 in the E4300). Result: No contest, this one goes to the E4300 by a country mile. You might expect this one to go to the 2710p, but actually the Dell lasts longer. I don’t have the extended battery for the HP, just the internal 6-cell one and I generally get between 4 and 5 hours from it with normal use. Dropping the display brightness and using other tricks such as setting the display to 16-bit I’m sure I could get over 5 hours, but not by much. The Dell lasts 6 hours with its higher wattage CPU, and the battery is also a 6-cell model. It does protrude out the back, although this doesn’t bother me at all. Another factor to consider is that I don’t know how old the HP battery was when I bought it, and I’ve used it for another 6 months, so it may have lasted a bit longer than it does now (although going by the reviews I’ve read I seems to be getting similar battery life). With the E4300 I feel I could possilby get through a whole day’s work on one charge, as long as I aggressively used the power saving features and put it to sleep when not in use. Both have webcams and VGA ports (I can forgive the 2710p for this as when it was made displayport wasn’t available and HDMI wasn’t all that common, but why on earth are Dell putting VGA ports on laptops in 2008/9?). The Dell has an anemic two USB ports, and one of those is a dual purpose USB/ESATA port. The Dell has a built in DVDRW, the HP has one but it’s in its docking station (which is actually designed to be left on the laptop if you so chose, it’s rather slim). If you chose to leave the docking station on you get another 4 usb ports bringing the total to 6 which is pretty incredible for a 12” device (admittedly a rather bulky one). I don’t have the Dell docking station – it has more USB ports and a DVI connector, but it’s not the sort of thing you’d throw in your laptop bag. The HP has bluetooth, WLAN, WWAN (HSDPA, or 3G), whereas the person that configured this E4300 omitted the bluetooth option! I can forgive him/her for not adding HSDPA but omitting bluetooth is inexcusable. Maybe Dell are to blame for overpricing an option which costs just a few dollars to implement. While the ESATA feature of the E4300 is nice, this one goes to the 2710p easily for having Bluetooth as standard and more flexibility. Without its docking station the 2710p is obviously quite a bit smaller and does weigh less. With it attached however the weight is actually about the same. The 2710p does feel a lot “denser”, and my first impression of the E4300 was that it is rather light – probably because the weight is spread over 13 inches rather than 12. Size is a matter of personal preference and the weights are similar so the result is a TIE. The Dell feels more solid, but the HP is handicapped somewhat by being a tablet as it has to have a rotating lid. Both have metal bases, but the HP has a matte finish on the base which doesn’t appear to dissipate heat as well, although that may not actually be the case, just my impression. The HP’s lid is plastic, the Dell’s in a much nicer brushed metal. The Dell wins narrowly in terms of thermals, it gets a bit warm on the lap but not quite as warm as the 2710p. The screen of the 2710p weighs quite a bit which puts more stress on the hinge, and the latch is fiddly and difficult to release with one hand. 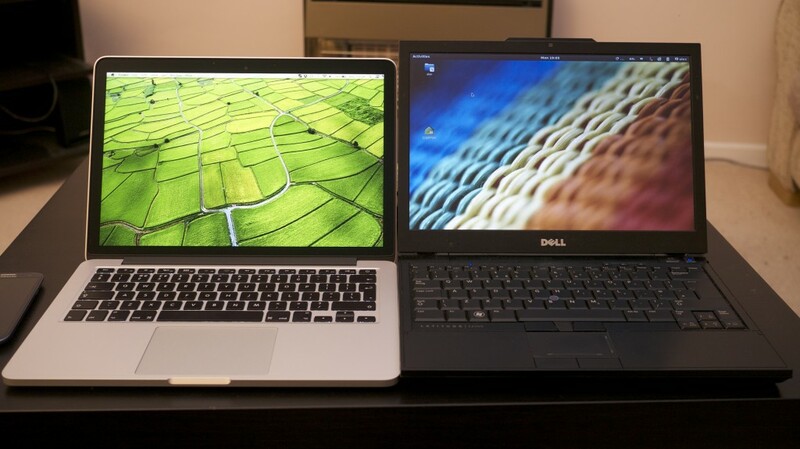 The Dell’s screen is lighter, has a really nice hinge and a magnetic latch which is effortless to open. While this isn’t really fair due to the different nature of these devices, I’m giving the edge to the E4300. Well the 2710p is a tablet so we’re not really comparing apples to apples here (although that was never my intention, I just want to decide which one to keep). The Dell has a trackpoint and touchpad which makes it more flexible than the 2710p (which only has a trackpoint) in laptop mode. The keyboard of the 2710p feels nicer, and in my opinion is higher quality – I’ve had several people comment on how nice it is. The keyboard on the Dell feels cheap, but in actual use it’s pretty good – I can type very fast on it. In terms of keyboard layout, having the page up & down keys right by the arrow keys on the Dell is fantastic – the HP’s are virtually impossible to find without looking, but it is more constrained for space. The Dell lacks the right click menu “application” key, which many people probably don’t use but I actually miss. It’s especially handy for spell checks as you just navigate to the word with the keypad and then hit the button instead of switching to the mouse. I like the third mouse button of the Dell though, it’s extremely handy when things don’t quite fit on the screen (rather common at 1280×800). Result: While the HP is a tablet I can’t really take that into account so the result is TIE. The 2710p’s display is really nice. Both are 1280×800 and LED backlit but the Dell seems to have a problem with moiré (I think that’s what it is), where you can sometimes see very fine diagonal lines moving across the screen. It feels like Dell cut a corner here, and if I had paid $4000 for this I would be pissed. Brightness is comparable, the E4300 is obviously larger but that isn’t a consideration here. The Dell also seems washed out by default, I had to reduce the brightness in the Intel control panel applet, but the HP has never needed any sort of adjusting. Result: 2710p, and very comfortably. The E4300 has Latitude On, a lightweight Linux distribution which you can boot into to check your Outlook calendar or email without waiting for Windows to load. I haven’t installed a Linux distribution on it, but I assume hardware support won’t be a problem, it’s mostly Intel stuff. Dell generally seems to have pretty good Linux support, as they offer Ubuntu on some models. The 2710p never had any problems with Linux, even the tablet functions are supported. Like the Dell, it’s mostly Intel hardware, and even the bits that aren’t Intel are supported such as the Sierra wireless 3G card and the Wacom digitiser. UPDATE: Originally I called this one a tie, but my faith in Dell’s Linux support is somewhat misplaced, there are issues with Linux on the E4300 but to be fair you get this with any new laptop model. Also I gather they are “working on it”, and the problems should be fixed with an updated bios. It’s difficult to decide actually. I have a desktop so a laptop for me is a portable computer, and portability is more important than performance. However with the E4300 I don’t feel as though I’m giving up much portability to gain a lot of power. The tablet functions were handy, but it’s not something I use everyday and I can certainly do without it. So I feel the performance trumps the pen. The HP night-light was very handy, and the E4300 has a backlit keyboard as an option but this one doesn’t have it. At this stage I think I’ll keep the E4300, I feel it suits me better and allows me to do more things on the road than I could on the HP. The eSATA port and more powerful CPU make running virtual machines a possibility, which is something I wouldn’t bother with on the 2710p. Both are top-class laptops, and while neither is without flaws the overall quality and design of these laptops is quite outstanding (and you’d hope so too given their recommended retail prices). But I’ll be using the Dell for a few more days before I finally decide! This entry was posted in General, IT and tagged 2710p, dell, e4300, hp, laptop on April 2, 2009 by Alex.